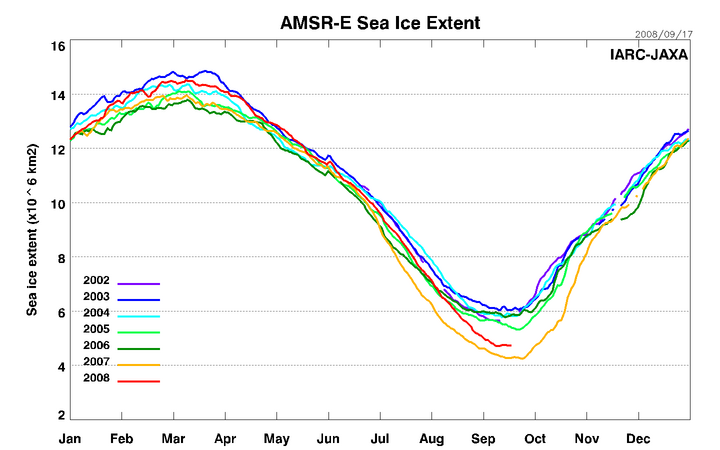 Sea ice extent is now beginning to rise as it has now begun its seasonal increase in response to autumn. We will be settling for second-lowest on record. While we didn’t break the record, this year is further support of continued and accelerated decline in NH sea ice extent. It will be interesting to see how the trend continues over the next few years. Ummm…if this year had far more ice than last year, how exactly does it support the “continued and accelerated decline” hypothesis? I read a lot of articles about how the ice cap melted due to global warming, only to find out that despite the warming we have more ice.